The C. S. Lewis Society of California having the privilege of co-sponsoring the San Francisco stage productions of An Evening with C.S. Lewis. 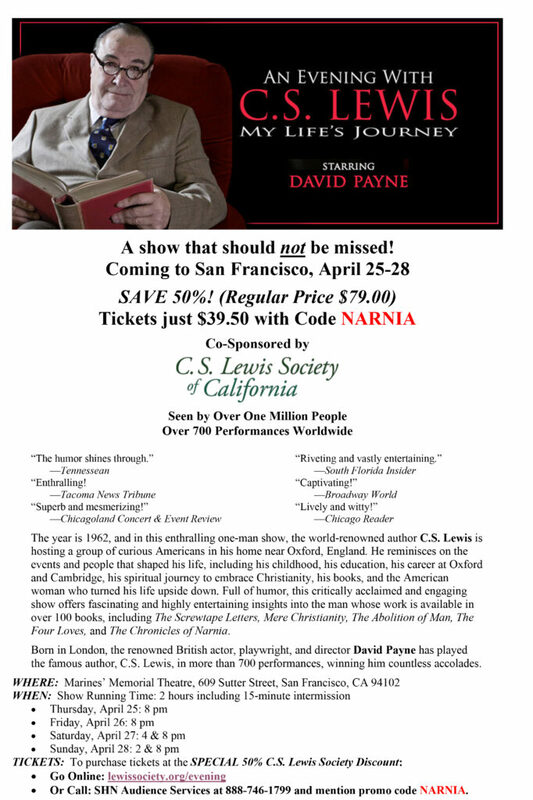 Featuring David Payne, this program will have six performances April 25-28, at the lovely Marine’s Memorial Theatre in San Francisco. Ticket Prices – $79.00 (full price), $39.50 (special discounted half-price). Each performance runs 2 hours long with a 15-minute intermission. In addition, we will be holding a special, 30-minute, VIP Q&A session with David Payne for attendees after the 8:00 pm performance on Saturday, April 27th. The Iowa Assessments are nationally standardized and recognized to meet most transfer or state requirements. Confidential, computer-scored results are emailed directly to the parents and include a variety of norm-referenced and skill mastery-referenced scores, along with interpretation helps. We offer two-day, in-person testing for those who want to have their children familiar with taking standardized testing outside the home, with the benefit of testing in a group which helps homeschooled students to be prepared for future standardized testing (SAT, ACT, CHSPE, etc.). At the corner of Sunrise Blvd., north of Hwy. 50, south of the American River. Subtests: Vocabulary, Reading, Language, Spelling, Capitalization, Punctuation, Mathematics, Science, and Social Studies. ensure that your student can be included in the testing. Overnight mailing fees and increased administration fees may be charged. I have been offering standardized testing to SCOPE families for twenty years because I want to give privately homeschooling parents the opportunity to have this option. As private home educators, standardized testing is optional. Not every family nor every student needs to pursue standardized testing, but for those who want this option, I am excited to provide it. I first tested my own five children when I was a newer homeschool mom because I wanted to see if my independent assessment of their progress was accurate. As my children grew, I continued to test them to see their improvement over time and prepare them to be comfortable in a formal testing environment, so that they would be more comfortable with the format and environment in the future when they took the CHSPE, SAT, ACT or any other formal test. My eldest children even said that when they sat for their graduate school admissions tests (LSAT and GRE: Psychology), they thought back to their earlier testing experiences sitting amongst other homeschoolers. There are many reasons families consider testing. Some SCOPE parents consider the yearly testing as a test of the parents – to evaluate if they are effectively teaching. 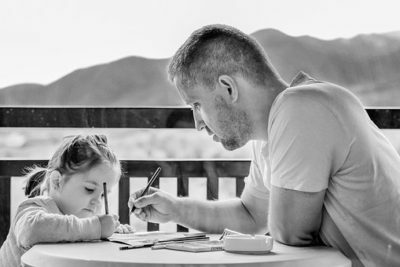 Some parents have their students tested because they are curious where their student stands on nationally standardized tests, and some have told me that they have their students tested because they want to have a tangible way to satisfy extended family members who are critical of their homeschooling efforts. Some test every year, some every other year. If you decide to have your students tested, you should know that our test supplier now offers online testing, so that parents can test their students at home. Some families cannot orchestrate the required uninterrupted timing of two consecutive days with 2- to 3-hour test sessions with a supervising adult in the room at all times, some cannot or do not want to deal with the compatibility and technical requirements, and so group testing is helpful. Others want the group setting for their children so that they will be comfortable with future standardized testing settings. Still others are excited to proctor the test at home. Please know that testing is not essential, however. God is at work with you and through you to prepare your child for their future here on earth, and most importantly, for their future eternity with Him. And standardized testing is not a requirement! I offer it as a way of bringing a little peace to the hearts of those parents who want the opportunity for standardized testing in a formalized, group setting but have no other means to provide it. One last personal word: I as a veteran homeschool mom, I am heartened that you homeschool your children and I want to encourage you! God is on your side and is faithful! Keep up this challenging job of teaching and discipling your children! Work unto Him and, amongst other blessings, you will enjoy years of thankfulness when your children are grown, knowing you raised them in obedience to His direction. Bless you, sisters and brothers! During a recent baptism service, my 5-year-old had a difficult time keeping still and staying quiet. At one point, when her 7-year-old sister poked her, she said, “Stop touching me.” I hoped nobody heard the commotion. I scolded both of them and then re-trained my focus on the pastor and the baptismal. It isn’t easy sitting in church with little ones. Our church usually has a place for the children during service, but during baptism services all the workers from the nursery and children’t ministries are invited into the room to help celebrate. This leaves parents to watch their own children. Normally that’s not a problem for me; usually I’m happy to have my children sit next to me, or on my lap, during a church service. But my 5-year-old girl has an extra amount of wiggliness. She doesn’t always remember to use her quiet voice, and she is generally impatient. “When is it going to be over,” if asked by this daughter more than I recall the same question being asked by my other children when they were her age. I realize that my daughter has an insufficient understanding of baptism. I know she only understands baptism as standing in front of the church body and saying some words, then going under the water and coming up to applause. But I also realized something else when she spoke about baptism. It became apparent to me that she is paying attention to more than I know, she is learning more than I give her credit for, she is being shaped and molded by what is happening in the church service. Her wiggles, noises, and impatience are being worked on, but more importantly, her understanding of what it means to be a part of the local body of Christ is being worked on – not by me as much as by the example she sees as she looks around each time we are in church together. I caught my daughter’s eye during church and winked at her. She smiled and kept singing and clapping. A moment later I caught her eye once again and smiled at her. She smiled back once again. Then, after a few moments, I looked her way and gave her the “I love you” sign with my fingers. She waved back to me. It was a simple exchange, a few moments unnoticed by others, but moments I will remember. Yes, yes, I know what you’re thinking. I should have been paying attention to the songs, to worship, to praise. But trust me when I tell you – I praised with greater fervency and vigor after that brief exchange with my seven year old girl. Let me tell you why. It wasn’t just her smiling back at me, it wasn’t the fact that she kept looking at me to see if I was looking at her. The moment was precious and lasting because we were both there – a dad and a daughter singing praise to our Savior and enjoying it together. She probably doesn’t realize why I was smiling at her to begin with. I smiled as I saw her reading the words on the screen and joining with the saints in singing. I smiled as she began to clap (a little offbeat) and as her eyes scanned the worship leader, the band, then over to me. My heart soared because there she was – my little girl – singing about the glories of God. My girl was learning to praise her Maker, to sing to Him and about Him in concert with the saints. There is no greater joy for a Christian father than the joy of seeing his children serve their Savior. Does my little girl understand everything she sings about? Certainly not. But she understands a lot and she is learning more daily. She learns as she watches worshipping adults, as she watches her mother and I, and as she imitates us. By the way, imitation is a powerful tool in the education process. If my daughter wasn’t in the proximity of adults worshipping together, listening to the preached Word together, encouraging and praying for one another, then her education would be stunted. I smiled at her that morning in church just because she was there. She was there and she was learning, she was learning to worship, learning to praise, learning by watching, learning by doing. Watching her sing praises made my heart soar. I winked at her and she smiled back at me; this tuned my heart to the work of God in the life of my children. He is at work all the time. I winked; He worked. He is worthy to be praised. From the back seat my 7 year old said, “Dad let’s have a conversation.” I’m not often with one child alone, so this was a unique experience for Naomi – just her and her daddy out on a date. The occasion was her seventh birthday date with dad. I’ve been doing these birthday dates for many years and always try to keep them simple and inexpensive. The main purpose is time alone with one child and the opportunity to engage them in conversation. Naomi didn’t wait for me to start the conversation, she was ready. “What do you want to talk about,” I said. We talked about the trees we were passing and then about what she was learning in her school work. Nothing profound. At the frozen yogurt shop she chose chocolate yogurt, with chocolate chips, chocolate sprinkles, and chocolate sauce. Yep, I took a picture. I didn’t have anything planned after yogurt so we ran an errand. We were enjoying the time together – just being together. These are the best of times, the times with no agenda. The mundane moments of life are the soil which grows the best memories. With that as a starting point I was able to share with Naomi. I told her that people have enough knowledge to believe God exists but they suppress that truth (see Romans 1). I told her how God opens the eyes of our hearts to enable us to see what we don’t want to see. I told her that my earnest desire and prayer is for her to know God, not just about God, but to know and be known by God. Sometimes we need to slow down, to take enough time to let our children start talking, to close our mouths and listen. Once they start talking, God will open up avenues for us to share His truth to the next generation. “Dad, can we have a conversation.” What a blessing to hear those words. I’m an ordinary dad with no special qualifications for the job. At times I wonder why God entrusted kids to me. The Maker of the Universe, the Sovereign Lord of All, entrusted an ordinary, normal, everyday, sinful human with the care and instruction of souls. What was He thinking? Well, it turns out that God hasn’t left the job entirely in my hands, so He knew what He was doing. He’s given me His Word and His Spirit; what else could I need? It also turns out that what God commands from me, He empowers within me. That doesn’t mean there is no need to work diligently to become a better father and to strive earnestly as I teach and train my children. But it does mean that God will help me in my striving; He will give me the tools, resources, and strengh I need to accomplish this most humble duty of being a parent. God the Father desired to use me in order to showcase His power through me. I came to this job with nothing: no qualifications, certifications, and nothing on my resume to fit the job description. Well, actually, there was that one thing on my resume. Right there at the top of the document it says, “Saved by the grace of Christ.” That’s all it took for God to find me competent for the greatest job on earth (other than being a husband) – the job of being a dad. I bet you know exactly how I feel, don’t you? There are times when nothing seems to be going right, times when siblings nag each other, when angry words escape your own lips, when going to church seems like a chore, when homeschooling seems more like a duty than a delight. There are times; they are real, and they are difficult. Yep, I know the feeling. But here’s the reality – long, long ago God thought about all of this. Long before you decided to homeshcool, God decided to use parents as the primary vehicle to train the next generation. He decided to use me, an ordinary man. And he decided to use you. God knew before the sun ever cast it’s first rays upon the earth that you and I would make this educational choice, but He gave us children anyway. My decisions regarding the education of my children don’t catch God unaware. God doesn’t say, “Homeschooling is a good option, but not for you.” Not at all. He knew my wife and I would find homeschooling attractive and He has plans to work through this decision for His glory and the good of our family. God doesn’t gaurantee any one of my children will be the next great inventor or artist, politician or author, but He does gaurantee to help me in my time of need if I turn to Him (Hebrews 4:14-16). Do you need Him as you parent? I do. As I wonder what He was thinking, I pray and ask for His help to accomplish the job He has given to me. He is faithful and always helps me in my time of need. What was God thinking? He was thinkging about me and my children, you and your children, long before the world began. His plans will not fail – even when I do. For that I praise Him. Isn’t that they way it is with our parenting also? It would be nice if our children, once pointed in a direction, continued straight toward that destination. Train up a child in the way he should go and all that. But the training part takes times and energy. Training isn’t a one-time pointing toward an object; training is constantly making course corrections, some tiny ones, some large one, but all important to keep things between the lines. When our parenting job is complete, our children’s trajectory will still need adjustments. We can continue to pray for them and give advice. But it’s at this point, the point when they are grown and not departing from the way they have been trained, that we will realize they still aren’t driving straight on their own accord. No one does. Our children, and we ourselves, only drive straight because Jesus has taken control of the steering wheel of our lives. Bearing with one another, being kind to one another, forgiving one another, and doing so with humility, gentleness, and patience – these are commanded in Scripture. Christ prayed for unity among believers, and every one of Paul’s letters speak about peace, love, and unity among those who claim the name of Christ. Unity is easy to agree with but hard to put into practice. It’s difficult to love others when we want our own way, when we feel maligned, misunderstood, and taken advantage of. But difficult as it is, this is what God demands of us. As a father of six, my household has it’s share of disagreements. Lack of love and peace often find their way in. Or, is it, that a lack of love and peace already exist inside the walls of my house and find expression from time to time? This is more likely. My family (and I include myself) are sinners saved by grace. We are being transformed into the image of Christ, we are being sanctified, but we are far from perfect. Fathers, you might find it helpful to study what the Scriptures say about unity among believers and teach and apply it in your home. 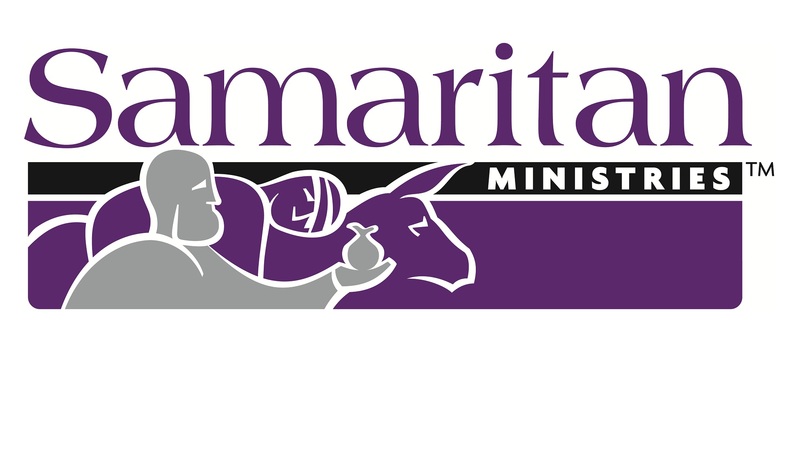 Do you see the connection between loving others and your Christian witness? People will know you belong to Christ when you show love for others. This love is to be expressed to more than your biological family, but not less. Even more important than people knowing you belong to Christ, is that people see a model and example of Christ sacrificial love when they observe your love for others. There is no greater love than laying down your own life for another (John 15:13). Husbands are commanded to love their wives as Christ loved the church and gave Himself up for her (Ephesians 5:25). When we give up our own demands and desires, and sacrifice the things we hold dear in order to serve others, we are modeling the work of Christ on our behalf. As dad and mom learn to love each other this way, children will see the love of Christ being modeled in the home. We can display an image of Christ truly or falsely by how we love one another. You may claim to be a Christian, but if you hold onto bitterness and anger toward another Christian, you proclaim a false view of God and your actions preach a false gospel. Second, we must beware of the enemy of unity. Satan prowls around like a roaring lion seeking someone to devour (I Peter 5:8). Satan is on the prowl around your home. He’s watching and waiting for the best moment to pounce. The enemy of your soul desires to create strife, jealousy, and bitterness within one family member toward the others. Slick as a Wall Street marketer, Satan works by appealing to your baser instincts. He knows your hot buttons and he knows your weak spots. He not only knows your kids; he know you and your wife. And he’s ready to take advantages wherever he can. Fathers need to be watchful of their own hearts first, then they can help guard their children’s hearts. The way to do this is to put on the full armor of God (Ephesians 6). Don’t blame all strife on Satan; our hearts are wicked enough on their own. But neither should we be caught unaware and think Satan is no longer active and striving to find a way to break apart the love and unity we should exhibit toward one another. Striving brings me to my third point. Third, peace, love, and unity demand diligent effort. After three chapters of doctrinal truth regarding our salvation by grace through faith, Paul delivers practical admonitions to the church at Ephesus. He speaks to them about master and slave relationships, parent and child relationships, husband and wife relationships, and many other practical matters. But he begins chapter four with a call to bear with one another in love. This is of primary importance for believers. It is important in a local church and no less important in our homes. Read Ephesians 4:3 in several translations and you will see the thrust of the Greek word. The idea is: striving eagerly, earnestly, and diligently – like a gladiator in training. A half-hearted effort won’t cut it; God demands more from us. He commands us to work diligently to maintain the unity of the Spirit in the bond of peace. As fathers seek to create homes where peace, love, and unity are prominent they must remember where the motivation to love one another comes from. Love for each other can’t be generated ex nihilo; love flows like water from a source. The source of our love for one another is found at Calvary. Jesus said to love one another “just as I have love you.” How did Jesus love you? By the sacrifice of Himself in your place. This is the Gospel, the Good News, it’s the well from which we draw our own supply of love for each other. To write is to die a slow painful death. At least, my son thinks so. He would rather do almost anything else. To read the text and fill in the answer blanks is no problem; that isn’t writing. Writing paragraphs, or even sentences, requires a different kind of work for him. It requires creativity and answers that aren’t in the Score Key. I don’t blame my son, many people don’t like to write. It’s an important skill, but it doesn’t come naturally. It must be taught. The other night I was given the opportunity to help my son learn to write. 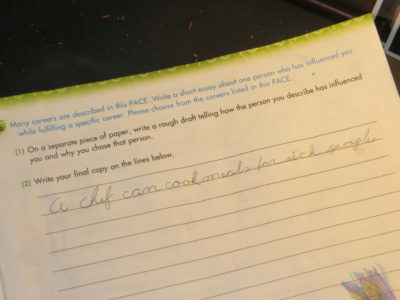 He had been learning about various careers in his Social Studies text and needed to write about how a person in one of those careers influenced him. He was stumped. A chef can cook meals for sick people. That was it; a one sentence essay. I had to admire his ability to get to the point, to cut out unnecessary words, to be clear and concise. I also recognized an opportunity to teach him a few things. We talked for a minute about the assignment and I made suggestions. He asked if five sentences would be sufficient. He just stared at me, maybe listening, but probably wondering how painful this lecture was going to be. Former experience with him told me I would need to do more than lecture. He really didn’t know what to write, or how to write it. The dilemma for me was to decide how much I could help. This was his project, not mine. It didn’t take long to decide. The project wasn’t as important as the process. I would use this opportunity to model for him. I would develop an outline, then write a rough draft, and have him copy my work. Observation is a learning tool; my son would learn by watching me. 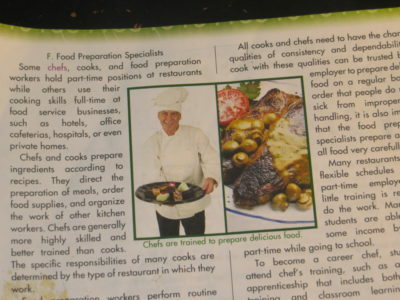 I turned in his PACE to the section about chefs and started reading aloud. From the text I developed a list of bullet points that formed a loose outline. I wanted to keep it simple, so I didn’t develop the outline into proper form. I took a blank sheet of binder paper and handed one to my son. I explained introductions and how they function, then we started writing. We continued on. The process from beginning to end was almost two hours. After he wrote the final draft neatly, I gave him a hug. I tried to keep an encouraging tone throughout. He was frustrated enough; he didn’t need me frustrated as well. I could have been upset that my evening was spent writing an essay about chefs. It would have been easy to be grumpy and complain that I had better things to do. The truth, of course, is that I didn’t have better things to do. What could be better than two hours teaching my son important lessons for life? He gave me a look I could write about. Academics have never been my strong suit. When I was 11 years old we found out that I was severely far sighted and could not see anything up close. The day I got my glasses is a day I will never forget. It was the first day I knew there were letters on a keyboard and wicks on a candle. Not being able to see held me back with learning how to read, write, and almost every other subject. As you might guess it was a little embarrassing, and at sometimes made me feel like the stupidest kid in the room. Once I got glasses and could see, I had to relearn everything to catch up. Basic school work was still taking me ten times longer to complete than the average student, but we still could not tell why. We tried everything, and thankfully, after much prayer, God lead us to an Optometrist who told me that my eyes never developed the basic skills they needed to work together. After 28 weeks of vision therapy, I noticed a significant difference in basic school work, but I was still behind. About a year and a half ago, we went to Sacramento State University and took a test for dyslexia, and the results came back positive. Finally, something made since as to why, even in my Junior year of High School, I was still struggling so much with my reading. Homeschooling was such a blessing because my mom was able to be a part of my schooling. She hand-picked the curriculum that would be the easiest for me, and always found ways to accommodate my struggles – letting me take my time with reading, and doing lots of hands on learning. I was able to study in a way that helped me the most, and I started to feel smart for the first time in my life. I started to tackle math, and reading. Although it will never be easy, it became do able and understandable. Not only was homeschooling a blessing academically, it was a blessing spiritually too. Most school days were good, and productive days. But there were the difficult days too. We either cried, had a meltdown, argued with a sibling, or raised our voices at our mom. Yet, those were the days we learned the most important lessons. My mom called them character building days. Where instead of traditional academics, we learned how to share, how to forgive, and to keep doing our best to conquer our struggles. We had to learn how to get along as a family, and how to appreciate both the strengths and weaknesses of each other. Homeschooling for me, wasn’t just about learning a subject in school, it was about building my character and learning self-control. Without having those hard days, I wouldn’t be who I am today. At the beginning of Junior year, it was time to finally start thinking about college. The thought of college was exciting and terrifying all at the same time. Excited to move into the next adventure of life, but terrified of the struggle that would come from not being able to do things at my own pace and not having my mom there to help me with the struggle. Then came another fear. A fear and worry a lot of kids have when they think about graduating and starting on the next path God has for them. What am I going get my degree in? What am I going to do with my life? Where does God want me to go? As this question hit me at the start of Junior year, I started to wonder, what was I going to do? Growing up we did a wide variety of activities. My parent’s goal was to help us find our God given gifts and talents. I loved it most when we did the art projects – drawing, painting, building a Roman Coliseum, and even Art Class. No matter what kind of day it was, art was always my outlet. It relaxed me on stressful days and kept me entertained on boring ones. Freshman year I asked to study art history, and found that I had an eye for art. When we moved the summer before my sophomore year, I helped my mom decorate and place the furniture. I fell in love with art in the form of placement and beauty. The way someone can take the simplest of rooms and use their creativity to create a beautiful space. It was then God really placed on my heart that I needed to do something with art. I dug into the many different art degrees, and I stumbled across Interior Design – a career that integrates everything I love about art, and creativity. Home schooling allowed me to find my passion. With all of my learning challenges I would have been so discouraged in the public school system, I don’t think I would’ve even wanted to apply for college. I am thankful that God used homeschooling to help me understand how I work best, and gave me the time to really focus on my relationship with Christ and my family. That was the biggest blessing of all.